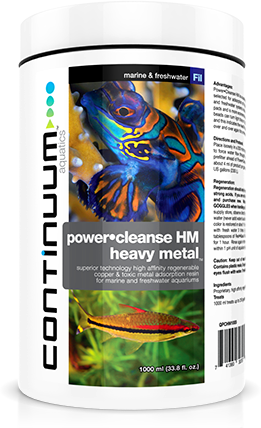 Power•Cleanse HM is a supreme quality, high activity filtration resin particularly selected for adsorption of copper and other toxic metals in marine, brackish and freshwater systems include planted aquariums. It will outperform fiber pads and is more economical because it can be regenerated. Its light colored beads can turn light blue or shades of gray depending on the metals adsorbed and this indicates the need for regeneration. Power•Cleanse HM is regenerable over and over again for a minimum of 2 years in normal use. Place loosely in a 200 micron polyester filter bag or filter chamber and position to force water flow through the product. For best results, use a particulate prefilter ahead of Power•Cleanse HM, such as filter floss or fine sponge. Use about 4 ml of product per gallon of aquarium capacity, or about 1 cupful per 60 US gallons (230 L). Regeneration should only be undertaken by persons familiar with handling strong acids. If you are not familiar and comfortable, them simply discard and purchase new. Warning: WEAR RUBBER GLOVES AND EYE GOGGLES when handling acid!! Add one part muriatic acid (available at pool supply store, observe directions and warnings on acid container) to four parts water (never add water to acid! only add acid to water). Soak resin until original color is restored or about 1 to 2 hours maximum. Discard solution. Rinse resin with fresh water 3 times and discard water. Let stand in water with 2 tablespoons of Reef•Basis KH Buffer or Flora•Viv KH+ or Basis Cichlid Buffer for 1 hour. Rinse again in fresh or salt water and test pH and make sure it is within 1 pH unit of aquarium pH and resuse as before.